Beautiful house & garden exceptional location 200m beach and hyper center! Discover the charms of La Rochelle by staying in this modern and elegant house decorated with taste. Equipped with a private patio accessible by French doors, you can enjoy long evenings with family or friends, unless you prefer to dine on the terrace in front of the house. Located in a very quiet street, you do not suffer from noise despite the immediate proximity to the historic city center. And at only 200m you reach a splendid view of the Atlantic Ocean with the beach of the Competition. You have places to park in the street, in front of the house to allow you a simple unloading. Children are welcome as it is equipped with many baby equipment including a small bath, cot and high chair. Bathroom with: -a shower -basin and -a toilet A baby bath is available on site. I can't rate the accommodation and location enough... period feature french town house located in the heart of the town... everything is within walking distance and so simple to find... Mo is beyond helpful and ever so nice... port and restaurants are all fabulous with lots of yummy seafood to choose from... We had 7 nights here and didn't feel the need to venture... we chose to chill in the house and read books some days, venturing out for strolls with our dog and of course lunch... There's a Carrefour literally a 2 minute walk away along with local wine shop, bar, patisserie, butcher and local veg shop... The images don't do the house justice either... thoroughly pleased and would highly recommend. We had 3 wonderful nights in this beatiful home. Very elegantly decorated and equipped with everything we needed; even a parasol and body board for the beach. 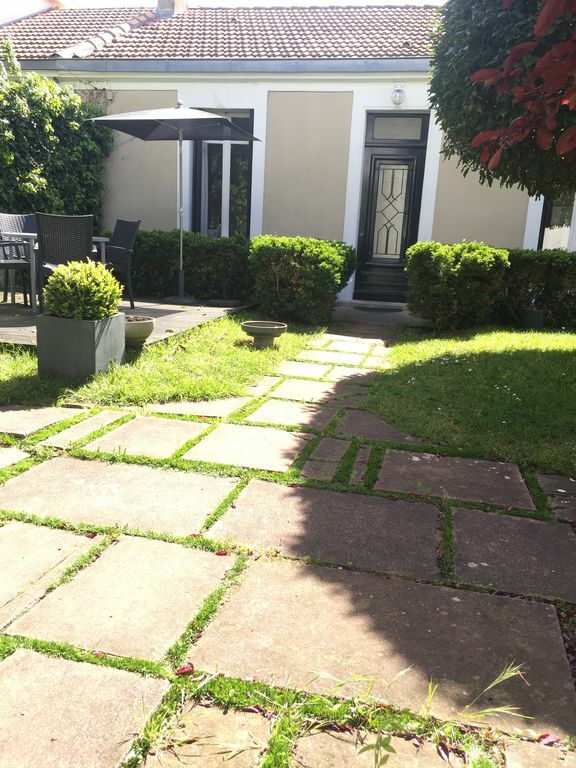 Lots of space for us and our 3 young children and a lovely relaxing garden. Highly recommended! Family of five, lots of room and very comfortable, a home from home. In walking distance of all the main tourist sites, a great place to stay. We stayed at this wonderful cottage for 5 nights, as 2 couples, and found it offered plenty of space, both inside and out. It had everything we needed, and more, and is ideally situated for easy access to the beach, the bus station, La Rochelle's historic centre and local shops/bars. We didn't rent a car for our stay but didn't need one as everything really is in walking distance. A visit to Ile de Re is a must; we used the local bus service which does an all day 'hop on/hop off' ticket - the perfect way to see such a lovely island. We found the property's owner, Mo, very helpful and friendly and we certainly hope to return before too long. My only hesitation in recommending this property and Mo highly is that we might find availability difficult as a result! Thank you Mo for ensuring that we had a lovely stay! Beautifully appointed well-lit house with spacious rooms annexed to the owner's main house in very quiet old neighbourhood. A delightful property that is well situated with a short walk along the beachfront to get you into the centre of La Rochelle. Communication with the owners was very good and we didn't have any problems at all during our 2 night stay. Would love to return to La Rochelle in the future and would look to use this property again. This charming home is located only 800m from the historic heart of La Rochelle. You'll enjoy your stay to visit this city full of cultural discoveries, such as its cathedral and ramparts. For gray days, you can choose between the Museum of Orbigny Bernon or aquarium in the city that will delight children. For golf enthusiasts, the first holes are just 7km. Une somme de 50 € est demandé pour le ménage à l'issue de la location. Une chèque caution de 500€ vous sera demandé au début de la location et vous sera restitué à l'issue de la location. Merci.